So is anyone else super excited about the Olympics? A lot of people hate on the Winter Olympics because they prefer gymnastics and and swimming, but I personally like settling down for three hour curling match (because three Olympics later, I'm still unsure of the rules), watching crazy snowboarding runs, and of course all of the ice skating outfits. 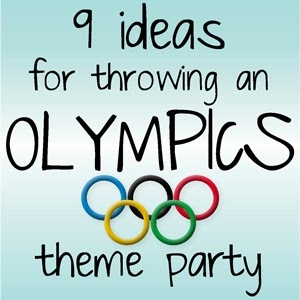 This year I'm actually throwing an Olympics theme party for my birthday during the last weekend of the Olympics, so I've gathered a few ideas for throwing a theme party around everyone's favorite athletic competition. 1. Opening Ceremonies: If you have it in the budget, try to get someone dressed as the Queen to jump out of a helicopter. Otherwise, play the Olympic Fanfare (Bugler's Dream by Leo Arnaud) and light a big candle as the Olympic Flame. 2. Food: Anything that comes in circle form is in, like donuts. I'm planning on making some Rice Krispie treats in a muffin tin and adding different colored sprinkles around the edges to make Olympic rings. You can also get cutesy and serve different colored foods in bowls arranged like the Olympic rings, like chips with different kinds of dip. Or if you just feel like making what you like, add some cute flag toothpicks to the top to make your food a little more festive. 3. Drinks: Moscow Mules are already trendy, and on theme for Sochi. White Russians are also in, for obvious reasons. Otherwise you can serve something clear and add Lifesavers as Olympic rings, or go for the gold and serve up some Goldshlager. 4. Games: Obviously an Olympics party needs a lot of competition. Standard drinking games like flip cup, beer pong, and chandelier are definitely in. Also consider adding some oddities, a la "Flonkerton." The winners get medals, of course - I'll be making mine out of metallic poster board and some ribbon. 6. Music: We are the Champions, Proud to be an American, and the Jock Jams soundtrack on repeat. Plus the Star Spangled Banner everyone supporting the USA wins an event (presenting medals on a dais: optional). 7. Entertainment: Turn on your TV to the actual Olympics for those who are so into the games they can't be away from the TV for a minute, or play Cool Runnings and The Mighty Ducks II over and over and over again. 9. Decorations: Lots of flags, lots of Olympic rings, and maybe a backdrop that will confuse your guests into thinking they're actually competing in front of thousands of screaming fans. Will you be throwing a party for the Olympics? If so, toss me any ideas you have! I love this idea! I actually like the winter Olympics a little more than the summer just because there are more sports/competitions that I enjoy watching. Those cakes in shape of the five rings are phenomenal! Have a great weekend! I wish I was supporting the Olympics this year, because I love your ideas! I know it's not the athlete's faults, but I draw the line with animal cruelty! Love this! Some great ideas here. 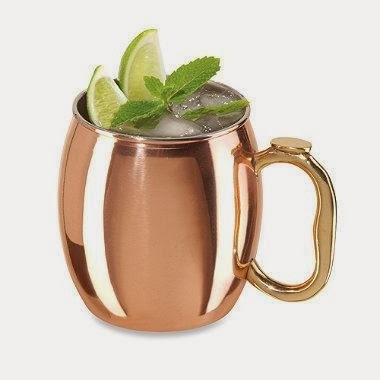 The Moscow Mule looks delicious and I love the cup. I love the Olympics and this post! Great blog! I really like the ideas! 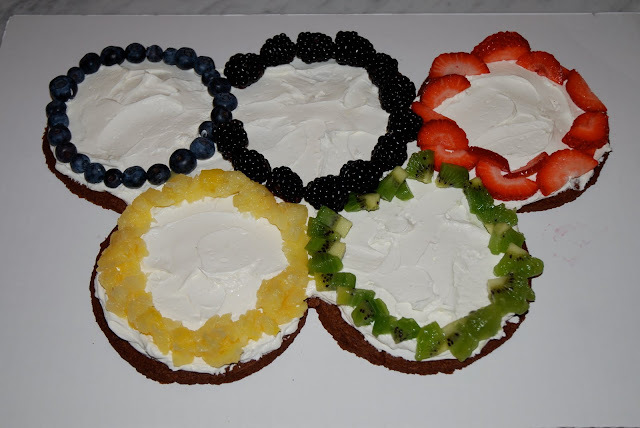 I'm not really into the olympics but I try to keep on track of them a little bit :) I really love the cake! What about the speed skating where they fight for position? I feel like that would be something swimmers would enjoy. The fiance is a former swimmer too and it's so funny watching the summer Olympics with him because he gets so into it and he swam against some of the USA guys in high school so he knows who they all are. Oh it was definitely a hit at the last party, I highly recommend it. Oh because of the dogs? Yeah that really was sad. I feel like they could have come up with a better solution. Hope you had a good one Alex! You are possibly the first person I've ever heard express that opinion! Yay winter sports! !